It may seem that newborns sleep a lot and their new parents do not. Especially for the first weeks, the best strategy is to forget about schedules and nap when your baby naps. 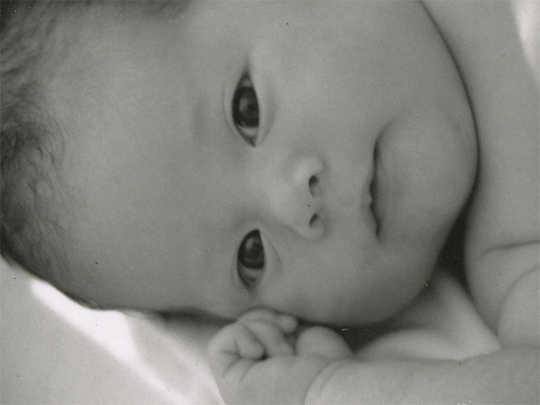 Newborns move through varying levels of alertness. The ‘least alert’ is their deep sleep, when they are unperturbed by any noise or fussing. This deep sleep is important for their brains as they are adapting to this world. Next, a newborn’s sleep will be lighter; they’ll make faces, snort, fidget, though they are still sleeping. Eventually they’ll move to a drowsy state, when they open their eyes half way, close them for awhile. If you pick them up at this time, they may move slowly into a more wakeful state. Then they are quiet and alert, gazing at the world, listening and absorbing (as the lovely newborn is doing in the photo). That’s a great time for nursing. The most ‘alert’ state is when they are crying: very vocal and hopefully not getting too red in the face. That burns up a lot of energy. Crying is the last signal of hunger. Watch your baby unfurl and you’ll catch those hunger cues a lot sooner. Both you and your baby will be calmer in general and calmer about feeding. Newborns have no schedule or rhythm for night and day and they won’t for several weeks. You should nap whenever your baby naps so you can rejuvenate yourself. This is a unique and sensitive time, an opportunity to observe and learn more about your amazing, unfurling newborn. Sign up for my monthly newsletter and learn more.